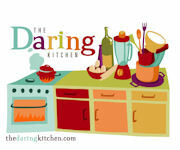 You are the coolest and have such a divine ability to do desserts and treats! I am going to make these for my aunt for Christmas. I have tried other recipes but i can tell just by reading this one that this is the one I was looking for!! god bless you in all your dessert works and thank you so much for sharing. Thanks for the kind words and the visit, Kriss! 🙂 I’m sure your aunt will love the mints. Have fun making them! I just had to stop back in to tell you how great these mints turned out 🙂 Not only did I get some muscles I have never seen before in my arms lol, but my Aunt truly loved them at Christmas ( and shes a hard one to please). For the fall I think I will be putting some orange drops in them, placing them in the freezer for a bit, and than dipping them in a dark chocolate coating. mmmm. Cheers to you and your blog once again! I found your post on Pinterest and I was SO excited! I love these mints but I never knew what they were until now. I do believe I’ll be making some this weekend! My grandma used to make these for weddings. She pressed her “dough” into tiny metal molds instead of piping them. Might be easier on the arms…. I made these for a wedding today. Knowing that between 100 and 150 people would be at the wedding, I tripled the recipe to allow for 3–4 mints each. I don’t know if mine ended up a lot smaller than yours or what, but I ended up with at least 1000. I also struggled to make the perfect point on my “stars,” ending up with a sort of squiggly blossom thingy that looked okay instead. They do taste delicious! These mints are so delicious! I did have a problem with them being really soft and not setting. Any suggestions?….also what size tip did you use for the ones piped in the picture? Very elegant! Hi, Brenda! Thanks so much for your comment. My mints didn’t set properly until I put them in the refrigerator… Did you refrigerate them? If you did and it didn’t work for you, you could add more powdered sugar to stiffen the mixture. I’m pretty darn sure I used an Ateco #32 tip for these (it’s been so long!). I gotta ask about the powdered sugar… Is it 2 lbs of sifted powdered sugar or 2 lbs of powdered sugar (and then sift)? Hi, Toni! Measured by weight, it doesn’t matter. The powdered sugar will weigh the same whether it’s sifted or not. I use a 2-lb. bag of powdered sugar for this recipe. 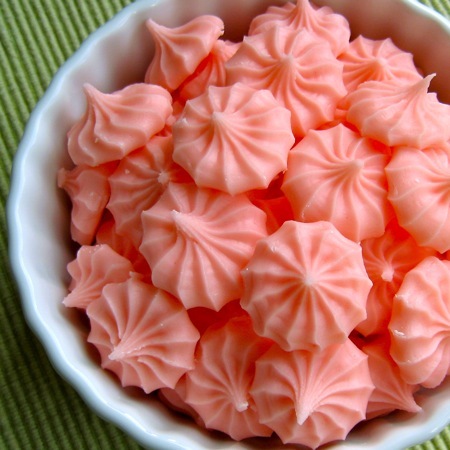 I want to make these for my daughters graduation party, I was wondering if after they are set up would they be able to be put into a ziplock bag and kept in an ice chest only putting out a a plate full at a time, would they hold thier shape….her party is at a park so might be warm. Hi, Brenda! If the mints go straight from the refrigerator (to set up) to the ice chest, and you only put out one plate at a time, I think you’ll be fine. They will get soft at room temperature, though, and they’ll get soft even faster at a warm outdoor event. If I were you, I would think about making a small batch (quarter recipe, maybe?) and testing it out before your event. Hi there! I tried making these mints last night and I think something went awry. Here is how I did it: melted the cream cheese and butter over a 1 or 2 heat setting on my electric glass top stove. Turned the heat off and started adding the sugar in 1.5-2 cup increments. Towards the end of mixing the sugar in, it became extremely hard to mix (even over the burner) with both my husband and I working at it! I was sort of happy to see that ours had gotten relatively stiff after reading your note about em not holding their shape. Then, after mixing all the ingredients, I took the pot off the burner and divvied the mixture between 4 bowls (I wanted to try 4 different colors). Then basically my husband and I would switch off piping the mints and mixing the food coloring in. The mixture was tough to get out of the piping bag – we ended up with a lot of misshapen shaky spiderweb-looking blobs! Now, I do know that we are not master pipers by any means! However, I find it hard to believe that our mixture was the same consistency. I’m wondering if perhaps it should be over a higher heat or leave the heat on while mixing. Maybe even lessen how much sugar goes into it. I’m eager and excited to figure it out (the mixture tastes awesome and they look adorable) but I can’t figure out what went wrong. Any advice? Hi, Katie! Sorry things didn’t go so well for you last night. I can think of two things that might have gone wrong (and you mentioned them both). First, I find that electric burners (coils or glass top) don’t tend be be quite as hot as gas burners on low heat. So maybe medium-low heat would have worked better. You want the cream cheese and butter to be totally melted and loose before you start adding anything to it. In terms of the thickness of your mixture, it does take quite a bit of elbow grease to pipe when it’s at the proper consistency. Did you use a 2-pound bag of powdered sugar, or did you use more? If you used the 2-pound bag, I’d recommend cutting one or two cups next time to see if you get a more manageable consistency (but one that still holds its shape!). If you try again, pretty please let me know how it goes. Awesome – thanks for getting back to me! I’m glad to know that I wasn’t completely off in my thinking. 🙂 I used the full 2 lbs of powdered sugar. I did not sift it – would that have made a huge difference? These sound so good. I am going to make them for thanksgiving. They would be good in other flavors as well. And you could change color to match a party or what not. Thank you for this recipe! I made them today and they’re fantastic. Mine set perfect, I placed the pan in a bedroom we keep the heat off in during the winter. My mom made these for years and I never asked her the recipe. I didn’t melt anything, I just let all my ingredients sit out for a couple days. When I put the cream cheese and butter in the mixer I just beat the crap outta it for a couple minutes. So glad you enjoyed them, Mary! Thanks for letting me know (and for providing an alternative way to incorporate the ingredients). I made these with mint instead of peppermint and they were so good! I tinted half of it green, put both colors in a piping bag so when I piped them they came out I with both colors. Can this new pressed into molds also? Hi, Tricia. I haven’t tried pressing the mixture into molds myself, but I think it would work. If you try it, will you report back, please? Hey, Erika! Yes, piping the mixture is quite a workout. I had the same experience! Glad you enjoyed the flavor of the mints, though.